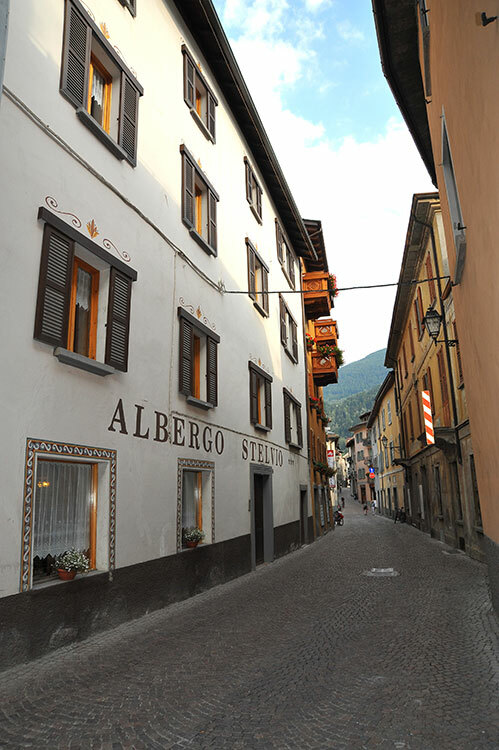 Located in a picturesque corner in the historic centre of Bormio, behind Palazzo De Simoni and a short walk from the pedestrian area, Piazza del Kuerc and its typical restaurants, Via Roma and various shops in the centre, in the immediate vicinity of Terme Bormiesi. It is a warm, welcoming and typical mountain hotel suitable for friends, couples, families and guests who enjoy family-run hotels. Well-designed with large living rooms, a TV room with a typical STUFA BORMINA (Bormio stove), to enjoy a warm herbal tea or a Braulio Bitter from our bar in cold winter evenings. Relaxation area, sauna, small gym and self-service laundry with washing machine and dryer (service available at an extra cost). All the rooms, which have been completely renovated, are furnished with taste and simplicity in the continuous alpine style that distinguishes the hotel, and are equipped with satellite TV, telephone, safe and private bathroom with large mosaic showers. An internet point and free WI-FI connection are available in the whole premises. Every morning, a hearty breakfast with sweet and savoury food is served in the dining room with a panoramic terrace on the first floor. Our Guests have special discounts at several restaurants. Guests can take advantage of the free shuttle bus service between the hotel and the ski lifts. We have special arrangements with the thermal services Bagni di Bormio. After the recent renovation, we offer the possibility of staying in new apartments equipped with every comfort within the hotel.